I’ve been working on a new Donation Incentive image. It’s been a long while since I last made one, lost track of them with school and etc. But I think this one was worth the wait. Any amount of donation will be taken, I don’t do the “minimum amount” thing. And if you can’t use Paypal, email me and we can work something out. Thank you. I had a really hard time with the writing on this one. In the original draft Selkie, both to prove a point and due to feeling hurt and angry, licked Todd's hand instead of the quick peck I went with in the final version. In my head, Selkie licking Todd's hand looked humorous and exaggerated, like a cartoony dog lick. But once I sat to actually drawing it, it looked... kind of weird and creepy. Plus, even though Selkie is an eight year old kid with some anger and coping issues, I think she's been raised well-mannered enough not to lick people. Once I started putting the licking out of my head and on to paper, it didn't look funny or cartoony at all; it looked creepy disgusting and disrespectful to a degree that it just did not work at all. So, after a bunch of redraws, we got the panel three we have now, and Todd gets spared the effects of a more potent exposure to Selkie's saliva. Poor sweetie! It’s not surprising her saliva might be an irritant; that’s actually a cause of allergies in humans to furry critters. Still, poor sweetie! Maybe a nice toothpaste with neutralizing properties? Oooh, I agree on the licking bit. Honestly, I think it would have made her too animal-like. This is sweet and touching; as you said, a lick would not just have been creepy, but have dipped into “What Measure is a Non-Human” IMO. Also… (Okay, I really do not mean this in a filthy way, even though I suppose there’s no other way to go with my next question. I guess it’s just because Selkie is currently a little girl, I don’t like thinking of her in adult situations ^_^) This revelation reveals that Selkie cannot have physical relationships with other humans, kissing or more, unless this is JUST Todd (which is unlikely). That’s… so terribly sad. Selkie! My darling, so many hugs (AND kisses!) for you! Fail on my part for not phrasing that in the form of a question, but I also kind of figured it would either (a) be answered in story soon, or (b) be answered in story eventually. :3 But just in case- will Selkie ever have a human BF/GF? While it is obviously way too early for this sort of thing, I’m shipping Selkie x Georgie. I can’t believe after years in an orphanage with x amount of other children, and a few years of school, there has been no direct or indirect contact with Salkie’s saliva and another person’s skin. Too many ways for it to happen – shared drink, someone picking up a glass she’s drank from, an up close and personalized raspberry, one of the orphanage’s workers or nurses wiping her face, congratulatory and I’ll miss you goodbye kiss to a friend who got adopted. Just too many ways for it to happen when surrounded by other children all the time. I don’t have time to look back at Grandpa and Grandma’s first visit, but certainly Grandma would have gotten a kiss on the cheek in sometime, I’d think. So yes, I’m certain it’s just Todd. And with his luck there’s probably a shot for it, and it’s not administered in the arm. That’s pre-supposing she’s a physically affectionate kid. A lot of kids with abandonment/abuse issues avoid physical contact like the plague. Plus living in an orphanage where you never had enough space would make anyone with any degree of sensitivity avoidant of personal contact and jealous of having their own stuff that didn’t have to shared, no matter how small a deal it might seem to someone who had a normal upbringing. Remember, she was JUST adopted…we don’t know that she usually kisses people. Even normal kids at that age have an aversion to getting cooties from kisses and in an orphanage environment where everybody knows everything that goes on in short order it’s highly unlikely she’d’ve created any more easy reasons for the other kids to pick on her. If it didn’t happen frequently, caretakers would just chalk it up to a strange rash that eventually went away without even connecting it to her. If you work in an environment like that or have school age kids, you get exposed to all sorts of potentially infectious bacterial/viral/fungal problems as a matter of course…the greater majority of which do disappear on their own as long as your immune system is healthy. Todd may be slightly more allergic than the norm but it is not unrealistic to think nobody connected the dots before this, not when they still think she’s “allergic” to plants. Those are two occasions have special connotations that may make them exceptions that prove the rule. Georgie has been what amounts to her only friend for ages and in the second she just discovered that’s the person who is going to be her new dad. That doesn’t necessarily make her very affectionate under normal circumstances with normal people (she hasn’t tried to kiss any other members of her new fam yet, for example), nor do hugs show the same degree of affection equated to kisses. Given she was in a hostile environment where she was bullied for being different, I still think it highly unlikely the kissing-causes-a-rash issue would’ve been discovered. Especially now that we know the orphanage actively discouraged kissing. You forgot biting. If she was there from as young as they say and has been bullied all that time, there has to have been at least one instance of her biting someone who needed to back off. With an overseer like the one her orphanage had, biting’s not that likely. Cases of kids – even in tougher situations – biting other kids are pretty rare compared to the number of kids out there. They seem commoner than they are because they’re so memorable. Well, I don’t know if it’s necessarily that she’s poison so much as he’s just allergic. … HUG HER TODD. HUG HER RIGHT NOW. I have a question, is Slkie’s skin blue or does she have scales. She does not have scales, she has skin. However, her skin is just slightly tougher than human skin, with a very light sensation of texture. Her blood has also been shown to be blue not red as we, and most other animals, have. The red color is from the iron in it. Blue blood can be found in some animals (squid and horseshoe crabs come to mind) who’s blood uses copper as an oxygen carrier. [Yes, Star Trek got it wrong when they said Vulcans had “green blood” because it was based on copper.] Selkies’s skin could be blue for the same reason ours is slightly pink – it’s from the blood that flows just under the surface. I would assume unlikely, just from wikipedia’s write up on symptoms of tetrodotoxin. That thumbnail looks hella sharp. My bestie and I often lick each other and/or her 14 year old son. You know, the “I’ve licked it, so it’s mine.” mentality. Rather silly (and wet) way of showing affection towards each other. My husband and I will do that too. Once when we were all being exceptionally silly we ended up practically having a massive lick fest. Oh dear, you sound like my family…. And this is a bad thing? If your family is anything like mine, it is strange and awesome. The conversations I have with my parents and siblings and “adopted” family are bizarre, wonderful, funny, and not appropriate for Selkie’s …. Er… Ears? I wondered how you were going to do that. I think, if I were Todd, I’d have held out the inside of my forearm to her. His position, last strip, just looked like the King or the Pope or the Godfather, holding out his hand for a peasant to kiss his ring. If I was Selkie I’d have been tempted to bite him. I see your worry about making her look too “animal” by licking, but I certainly wouldn’t have kissed him. Yeah, one other thing I wrestled with on this one was the implied subservience of the “kiss the hand” gesture. I don’t ENTIRELY like it, but tried to ameliorate the “look” of it by having Selkie give the defiant upward glare while kissing. In the end, extending his hand for demonstrating the rash is what felt, to me, like the natural reaction. Oh no! Oh no oh no oh no!! Oh, and the Ss on the end of most words are a speech impediment, like a lisp, or maybe an accent. But “I’s not poisons” is plain bad English. I haven’t seen her do any other examples of bad grammar. If you wanted that S in there for her accent/lisp, it should have been “I’ms not poisons”. Teaching your child is poison, that’s really sad, but I guess it’s fudamental she knows so know one else get’s it. Ha ha, she’s like a giant, walking, talking, blow fish. If you had wanted her to angrily do something, she could have spat at him. That’s totally an insult and seems less silly than licking. Although it still would be kind of immature (or at least dramatic) than what happened. I was expecting her to lick him, and while I can see why that’d end up looking weird when you put it to pen, spitting on him is one of the two obvious ways it could’ve been handled. The other is even easier–just leave it off-panel with a “schlurp” sound effect and maybe a slightly off-put reaction on his face. Can’t guarantee it’d work, but it avoids anything looking creepy. Poor Selkie, she just found another thing that sets her apart from the rest of the people in her world. Though I have a feeling she really got a good parent for helping her deal with it. The look of the sores and the fact Todd is only reporting localized effects (a poison would spread through the bloodstream). Selkie’s appetite, she eats quickly and a lot, and is hungry again soon after a meal. Selkie is a water breather, taking it in through her mouth, and her natural environment is likely a marine biome. Dave has said her species is fresh-water, not marine. And many things are poisonous to touch or cause a skin reaction, without actively poisoning you. Accidentally grabbing a stinging nettle will certainly cause painful/itchy rash and even blisters, but is unlikely to actually make poison spread through your bloodstream. The speed of that reaction is pretty incredible. Very few toxins could respond to human skin so quickly (I mean, that’s kind of the job of skin, right?). It’s actually not here that I noticed, but rather when I went back and checked the archives to make sure it was reasonable to assume it was Selkie-spit rather than a delayed reaction to something he’d contacted earlier. I do find it surprising that no adult has ever reported a serious abreaction to her vomit, particularly since we’re clear that she’s vomited many, many times since being turned over for adoption. Awww…poor Selkie. I agree with Mina, she needs a hug. And that is exactly what you shouldn’t say. I am insanely curious as to what the nature of Selkie’s saliva is. ai vin gave me a bit to mull over, although I’m not certain what her metabolism has to do as a clue regarding the true nature of her saliva. I have my own guess, though my evidence won’t come until I learn more about Selkie’s dentition. The clue is in how quickly she can digest the food she’s eaten to make room for more. Maybe I’m just unusually thick, but I’m still drawing a massive blank. I’m just going to have to wait for the reveal. Seven years late response but she likely has powerful pre-digestive enzymes in her saliva which cause a mild allergic reaction on contact with human skin. Also there is potentially a powerful beneficial bacteria culture in her mouth for predigestion or as an antibody response, considering her culture’s largely raw diet. However if she brushes her teeth regularly it’s highly unlikely as most toothpaste brands are anti-bacterial. Um… Dave? Where is the comic? All I get is the comments that you and others are leaving… the comic isn’t showing up for me… what happened? I have no idea, Thanks for bringing it to my attention. I just checked the main page and I see the same problem. I’ll look into it. Yay! The comic is back! Thanks for fixing it Dave! So… after reading the comments I felt the need to say something. This is either going to end up not being nearly as big a deal as it’s being built up to be or this is going to end up being tragic. By that I mean either Selkie is going to end up going back to her own kind, thus seperating herself and Todd…or she’ll be “emotionaly” alone among humans. Granted, if we find out her tears heal his wounds that would be hella awesome. While the way this came out is unfortunate I think Todd is doing the right thing by being honest. 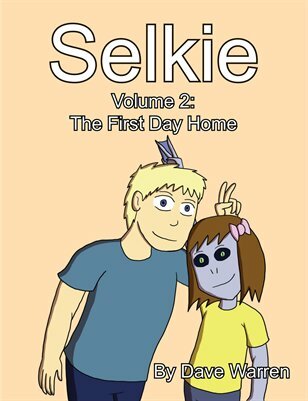 Selkie is different, there is no way around that, and that’s something she’ll have to accept and learn to deal with. She shouldn’t have to learn like this but what’s done is done, by backtracking and lying about it he’d just cause more harm further down. Still feel sorry for her but I’m positive the issue’s going to be resolved somehow. This is how it all begins, her saliva will slowly mutate his DNA until he becomes one of her kind. A zombie, a zombie of the sea….. Very different physiologies and Ph factors between Selkie and most or all humans. Reminds me of a SiFi short story where human body oils burned the aliens like acid.